If you have a need to powder coat a larger volume of parts then an automatic powder coating system may be the best choice for your business. The difference between a batch powder coating system and an automatic powder coating system is quantity. While batch systems provide an opportunity to coat small volumes of parts. An automated systems allow for much larger volumes with less labor. We at Powder X have been recognized as the industry leader in batch powder coating systems for more than 10 years. However, we’re are also one of the top suppliers of automated powder coating systems in the United States. Automatic powder coating systems are designed to include washers, ovens (both dry off and cure – or combination), spray booth(s) and gun(s) and a conveyor system. Each automated system is designed to offer specific solutions to a customer’s individual needs. Washers are available in a number of stages, including 3-stage and 5-stage among others. They are also available in either stainless steel or poly. Powder X also offers a single-stage washer, which could save you thousands of dollars on gas and water each year. Ask us whether that process is the right choice for your product. 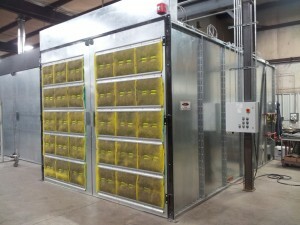 Booths are designed for spray-to-waste, reclamation, or both. Hand spray windows and automated guns are also available. Our automatic powder coating systems offer innovative, quality solutions at an economical price point. Contact Powder X and ask for one of our automatic powder coating systems specialists. They’ll help guide you toward the perfect solution for your powder coating needs.